Most people have never heard of neuroblastoma, a type of cancer that almost always affects infants and young children. It’s actually the most common type of cancer in infants and accounts for 6% of all childhood cancers. Unfortunately, it is responsible for a disproportionate amount of deaths. (11%, according to the Canadian Cancer Society.) Only one out of two kids diagnosed with Neuroblastoma will survive. It’s 40% relapse rate is frightening for any parent to consider. With current therapies, less than five per cent of children survive relapsed neuroblastoma. Symptoms of Neuroblastoma mirror common childhood ailments – fevers, tummy aches, leg pain, etc. By the time doctors diagnose a child with the disease, in most cases it has already spread throughout the child’s body. 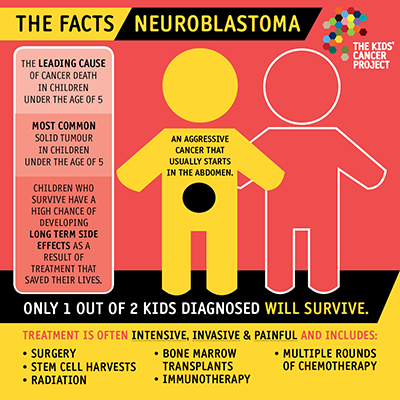 Neuroblastoma is a rare disease in which a solid tumor (a lump or mass caused by uncontrolled or abnormal cell growth) is formed by special nerve cells called neuroblasts. Normally, these immature cells grow and mature into functioning nerve cells. But in neuroblastoma, they become cancer cells instead. Neuroblastoma most commonly starts in the tissue of the adrenal glands, the triangular glands on top of the kidneys that produce hormones responsible for controlling heart rate, blood pressure, and other important functions. Like other cancers, neuroblastoma can spread (metastasize) to other parts of the body, such as the lymph nodes, skin, liver, and bones. In a few cases, the tendency to get this type of cancer can be passed down from a parent to a child (familial type), but most cases of neuroblastoma (98%) aren’t inherited (sporadic type). It happens almost exclusively in infants and children, and is slightly more common in boys than in girls. Children diagnosed with neuroblastoma are usually younger than 5 years old, and most new cases occur in babies younger than 1 year old. About 700 new cases of neuroblastoma are diagnosed each year in the United States.